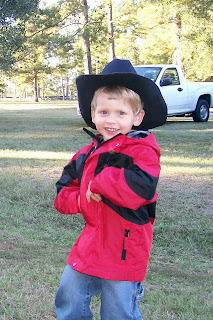 We went to a Halloween festival last night, but it was a bit chilly for Dawson's pirate costume, so we just put a cowboy hat on him and called it a cowboy costume. He was happy with it. 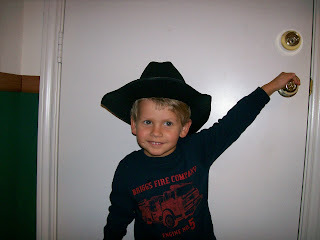 And he looks so cute in his cowboy hat! Dawson at the door ready to go to the festival. Here we are at the ranch where the festival was held. Dawson is so excited! !